Summer is an ideal time to rejuvenate existing concrete sidewalks, driveways and patios that have been neglected and have had their appearance diminished by the accumulation of grime, mildew and oil stains. With a thorough cleaning and the application of the proper sealer, exposed exterior concrete can be made like new and can be an attractive part of the landscape for years to come. The first step in rejuvenating exterior concrete areas is to remove any existing sealers and the surface grime that has accumulated. Ameripolish Strip and Clean or Prosoco Cure and Seal Remover are great options for this product. Once any sealer remnants have been removed, a deep chemical clean to restore the clean aesthetic can be achieved with a treatment of Ameripolish EZ Etch or Prosoco SafEtch. These products are superior to traditional acid washes in that they require no neutralization and clean-up is as simple as flushing the treated area with water. If oil stains are present, they can be mitigated with the use of products such as Ameripolish Oil Ingester and/or Prosoco Oil and Grease Stain Remover at this point. Once the concrete surface is clean and rejuvenated, an exterior grade sealer should be applied to protect the area from becoming degraded again. The sealer used should be UV stable, have resistance to mildew growth and salt damage, and protect against oil infiltration. Ameripolish X-Link and Prosoco GuardEXT are products that fit the bill nicely. Cleaning and sealing exterior concrete such as driveways, sidewalks and patios is a quick, simple and cost-effective way to enhance curb appeal and the early summer is an ideal time to do it. A majority of these workers were injured while performing their normal jobs at regular worksites. For further information and sources, see the links below. Stay safe out there! 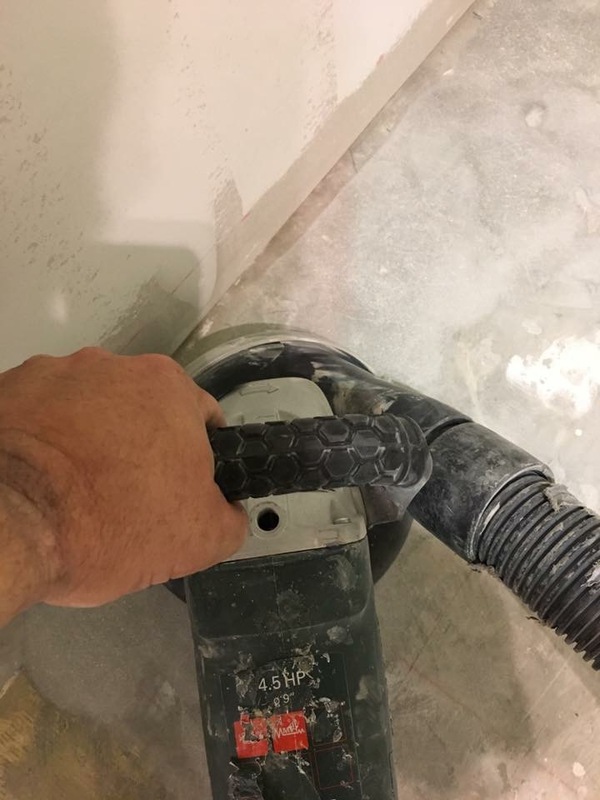 Edge polishing work is always labor consuming and troublesome, but the RSP hand pads, Drifts for dry work, and Whips for wet work, make honing and polishing edges as efficient and economical as possible. Both styles are available in 5” and 7”, so they will fit all popular models of hand grinders and both are available in grits from 50 to 3,000, so you can achieve the desired level of refinement with ease. 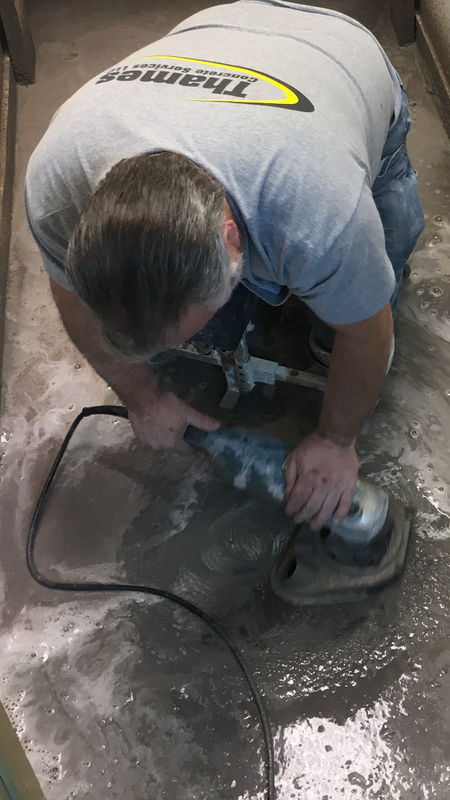 With the OSHA silica regulations in full effect, more contractors are electing to work wet, especially in the early grinding and honing stages where the most material is removed from the floor. Wet grinding and honing is also typically more aggressive than dry work at the same grit level. However, dry polishing typically yields higher aesthetic values at the same grit level as compared to wet work, and airborne silica levels can be kept in check with the appropriately sized and maintained dust extraction system. While both methods have their pros and cons, either way one goes, Runyon has their customers covered with the Drift Dry and Whip Wet pads. Floor Edges Looking a Little Rough? Do the edges of your latest flooring project have you edgy? Are you not getting the fullest potential out of your hand-held grinder/polisher? It might be the pads you are using. See how our quality RSP Drift Drys and RSP Whip Wets can give you the look you need. 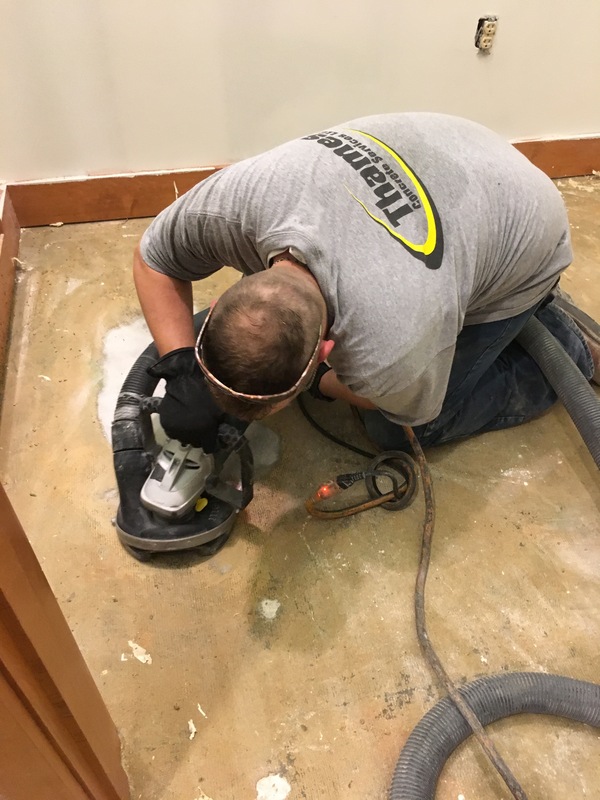 Runyon Surface Prep has the knowledgeable staff to help you tackle a challenging project. Stop by for a consultation or have us consult on the job site. We are happy to assist. Stain protectors, guards and sealers are vital for ongoing polished concrete floor maintenance. protector. Stain protection is vital to the long term aesthetics of polished concrete, providing protection from discoloring penetrating stains and chemical etches. There are three main categories of stain protectors for polished concrete; penetrating, semi-penetrating guards and topical sealers. Each has its own features and benefits and its own required upkeep schedule. Penetrating sealers: Made from a variety of silicones (silane, siloxane, silicate and siliconate) that penetrate deep into the surface. By sealing the access channels into the interior of the concrete, they shield against infiltration of liquids. Because they allow the concrete to breathe, these products are a good option for outdoor surfaces. Ideal for industrial facilities that want to avoid frequent applications, they provide invisible protection to the flooring. Since these sealers are not a topical layer, they do not alter the surface appearance by creating additional gloss or sheen and they also are not subject to being abraded away by foot traffic. However, they can breakdown over time and will need reapplication periodically. Use a sprayer and microfiber to apply this type of sealer. 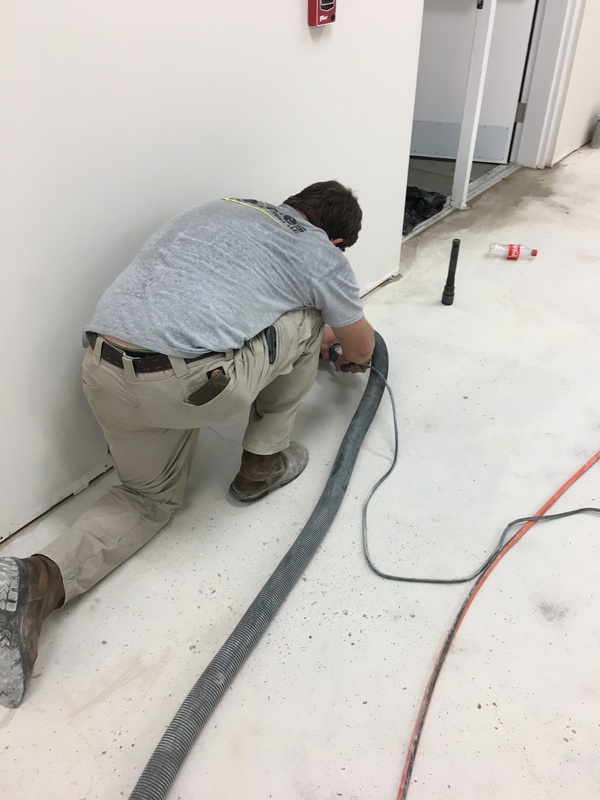 Semi-penetrating sealers: Often known as guard products, these have a topical aspect that will increase a floor’s surface sheen while also providing stain resistance and repelling water. Ideal for both indoor and outdoor concrete, these sealers (applied with a sprayer and microfiber) wear faster than polyurethanes and epoxies and need to be re-applied depending on the amount of foot traffic. Topical sealers: Give the concrete a high glossy shine while forming a protective ﬁlm on the surface, like polyurethane and epoxy. They are economical and easy to apply by spray or roller. These sealants repel water and provide a durable chemical and abrasive resistant surface. Ideal for retail spaces where the vibrant color and high sheen of the flooring is an essential part of the design. They need to be re-applied periodically due to traffic wear and some may yellow due to UV exposure. Regular maintenance to prevent stains and scuffs is required to keep the surface looking its best. The type of sealer you select determines the frequency and extent of routine maintenance. For industrial floors, penetrating stain protectors offer better protection and liquid repellency than topical sealers. Because they are not a coating like topical products, stains and spills need to be removed promptly to prevent damage. Diamond impregnated pads can be used to mechanically clean and maintain floors. They come in a variety of grits for a variety of needs. If you over-apply a sealer and need to remove a leftover haze or film, you can burnish with a high grit polishing pad to enhance gloss after reapplying the sealer or guard. Use a diamond impregnated pad in conjunction with a burnisher to eliminate the excess.